This is cross-posted from 'Tim on Youth Work' over on the C&YPN blogs. If you want to leave a comment, that's probably the best place to head to. When you look at our colleagues in education, not only is there masses of technology innovation happening in places like Futurelab, but the 'eduBloggers' are so active they even have their own awards ceremony for best blogs of the year! So perhaps it's time for youth work to catch up and get blogging. A blog is a flexible platform for sharing and communication. You've probably seen blogs that are someone's personal diary telling you everything they did or thought this week – but blogging is about a lot more than that. It is about generating communities of practice sharing news, resources and stories. It is about building strong networks and championing causes. And it's about creating the space for innovation, exchange of ideas, and new connections that all spill over into our day-to-day work and make youth work work better. How many different resources have you used in the last month? How many have you put together? How many would others benefit from knowing about and being able to use? With a blog you can share links to useful resources, or, if you've created your own, you can easily upload digital copies and make them available for others to download and use. You don't only have to share the resource, you can also share the story of how you used it to give context to the tools, and you can invite feedback from others through the comments feature of a blog. 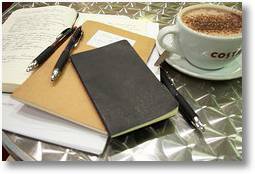 A blog can be your professional reflective journal. It is a space to 'think aloud' about the successes and challenges of day-to-day work with young people. And you can invite others to join you in your reflections through the comments on your blog, or making postings on their own blogs. The chances are that your professional interests are not just in 'youth work'. 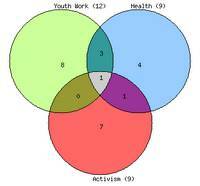 You might be interested in 'youth work' and 'health', or 'youth work' and 'activism'. You have a network of interests, and there are networks of bloggers out there with interests that overlap with yours. You can use a blog to join in those critical conversations, find and share ideas and to build dynamic and evolving interdisciplinary networks. Plus, your blog doesn't just sit there on the internet linking you to 'virtual people'. You can use it to carry on the conversation after a conference, or to keep in touch with a growing network of colleagues across the country. Good ideas should spread. If you've had a good idea – share it. Stories of good practice should inspire and challenge us. If you've seen a great example of youth work doing what youth work should – share it. When I say 'share it' – I mean, 'blog it'. A blog gives you a platform to make sure everyone can hear the new ideas, and can see what good youth work can achieve. We all know there are too few positive stories in the media about young people. But with a blog you can be the media. What are the positive stories you have to share? Readers of your blog can subscribe to get updates using an RSS reader, or sometimes be e-mail as well. What is your local paper was reading your blog of positive stories? And your local councillors? You might even want to experiment with audio and video and create a vodCast or podCast. The guardian recently ran a story on the evolution of local 'blogospheres'. Blogging isn't just about talking to people the other side of the country – it can be an effective tool for sharing information locally. Take for example Andrew K Brown's overview of the blogosphere in Lewisham. Does your area have a vibrant community of local bloggers? Could being part of it help you develop links and social capital, and promote a positive local voice for young people? Why else should youth workers be blogging? I'm sure the list above only touches a few of the reaons you might want to start blogging as a youth worker – if you've got other ideas, do drop them into the comments. Good overview of the benefits my friend. Thanks for the link, I’m firmly convinced that blogging is just as much about the local conversation as the global. There are of course youth work bloggers (one that I read is The (late) Breakfast Club, which is great. Good point – I should include the YOMO team in Youth Work bloggers – although they are still outside the statutory sector… I’m holding out for the moment on saying I’ve not found a youthworker blogging in the statutory sector. Hi Tim. Glad you’ve been enjoying the way we get along in Lewisham. I thoroughly recommend trying to network with local bloggers, and create a sense of local civic discourse. Thanks for the plug Andrew 🙂 nice to get a pat on the back! Of course I endorse Tims efforts – not least because it was his comments a few months back when we first met that pushed us to give the blogging thing a go in the first place. We’re reworking the whole of the YoMo site at the moment and the Late Breakfast Society will be central to it. I’ve also paid close attention to Mediasnackers and theres plenty there thats inspired some of the new developments we’re working on for our site redevelopment. I’d love to hear more from you. You’ve got great things to add! Thanks for the links. It’s interesting that it’s not been hard to find youth ministry people blogging – but still the statutory sector youth workers are not there (those employed by local government Youth Services or similar – as we have, albeit patchy and in flux, a tradition of such services.). Why aren’t they blogging? Two reasons seem to be suggested above. 2) They don’t know how. Mas makes a great suggestion above of putting together a ‘How to do it’ guide – and I’m definitely behind that. In fact – let’s do it. That’s not a term used for youth ministry in the US. It means they work for the local government (employed by local authorities). I would take the challenge beyond local authority workers to include the voluntary sector – many of who are equally as professional as their statutory counterparts and will certainly have as many interesting stories & experiences to share. Great conversation here – some fantastic comments. Happy to take this over to skype if *Tim is happy to coordinate? Be great to get some input from everyone so if you’d like to send over your suggestions/guidance/tips/advice and I’ll find a way to squeeze it all in! The guide is looking great Mas – I’ll reblog it to the front page here and on the YPN site as soon as I can. Forgot about this one! Not statutory but a good example for any potential youth work bloggers out there…. The guide looks great indeed! Great conversation Tim–just catching up in my reader. I do a lot of work in the US with government youth workers (Job Corps, for example, which is a federal program for disadvantaged youth) and technology is NOT on the radar. They’re lucky they use email. One thought that occurs to me though is that your point about blogs for professional development may be the best entry into blogging for people. It’s a safe, low-risk way to start blogging. I think part of the resistance comes from feeling like you have to do this really public thing where you’re blogging to market your organization and what if you say something people don’t like or whatever? But if people are blogging to support their own learning–to reflect, etc., this might feel safer. It doesn’t even have to be public for that matter. A tool like Vox would also give a way for people to blog both publicly with a network of other youth workers and privately for their own reflection, all on the same blog. Another entry point might be through microblogging, like using Tumblr. It starts as little bites of info and a more elaborate system of bookmarking and then can build. I’ve really been starting to think a lot lately about how do you get people to take that big step into blogging and I think it’s about finding low-risk, personally relevant and easy strategies. Great conversation! Blogs as professional development tools is certainly the aspect I’m pushing most at the moment. That’s been much inspired by your writing on Personal Learning Environments. I’ll have to look into Vox more as a platform to recommend if it can help people become comfortable with the interaction between private and public writing. Hi Tim–I’m playing around right now with doing a series on using Vox for personal learning, so that may help. Actually, I’m thinking a lot about a Social Media Starter Pack for learning–like what are the essential, easiest to use tools. I think people need a gateway into this stuff, so I’m trying to find the simplest solutions I can. That’s why Vox and Tumblr appeal to me–they lack some functionality I might like as a power-user, but they may be more than enough for people who aren’t going to go nuts. I’ve started blogging exclusively about social media for professional development, so that might help you with some other ideas. If you do experiment with Vox, let me know what you think. That’s a really good question. Why isn’t Youth Work training making the most of the discussion technologies out there. My wife recently took a module from a distance learning Youth and Community Work course, and seeing the very old fashioned discussion forum that they had to use – that didn’t encourage good interaction at all, was very disappointing. I guess the real advantage of new social media tools for discussions like blogging, or VoiceThread etc. is that they don’t have to be set up by the course provider – there’s nothing to stop students setting up their own tools and using them. Barry I would also challenge your course provider on this – any course that isn’t including some training on the use of online technologies can’t claim to be effectively preparing its students for future work with young people. For KYSPA our blog offers an online presence without the expense of having a designed website (though this is something we will get eventually). I’d like to see our members interacting more and leaving comments but nonetheless, the blog serves very well as a running diary of our events,and performances. Grant and funding providers can be kept up to date with how their money is being spent and potential members, and parents, are kept informed through the blog. The additional options of images and video are the icing on the cake really, allowing full public access to our work and achievements. I can’t imagine running KYSPA without the blog! Of course… getting the internet set up in my new house would be a bonus…. In any case, if you visit us at http://kernowyouth.blogspot.com/ check out our “Making Waves” posts, documenting the progress of our community project this far and our training with YoMo (which has been put to very good use!). Just a word of caution, though. 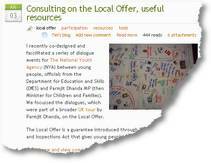 images on youth work blogs, naturally, need full parental consent and great care needs to be taken to avoid names of your young people being identified. Ref LA youth services and blogging – I think its down to lack of real invetsment in IT in some services for young people and youth workers to really get to grips with the benefits of blogging etc, LA’s also seem to be extremely tight on allowing workers to make comment outside the PR departments control or the IT depts corporate website requirements. I think its certainly an issue that the set up of many local authorities is too restrictive – but of the points Stig makes I think the one with most relevance is Youth Workers getting to grips with the benefits of blogging. I don’t think we’re necessarily talking of youth workers blogging while at work on the local authority PC – I think what we’re really looking for are youth workers who are bothered enough about what they’re doing to want to share their ideas and experiences and to do this of their own initiative. Blogs can be anonymous or they can be under a pseudonym so theres no need for the PR department to be an issue – in fact for most workers it could be wiser not to use their real name or to name who they work for and certainly not to name the people they’re working with. So while there are those barriers within the workplace they don’t need to be barriers to any youth worker setting up their own blog in their own time – barriers are things to be overcome – not an excuse for not trying – so who’s going to give it a go?! Well, whilst not currently working face to face on a regular basis I am involved in the Statutory Sector and trying to give this a go! I’ve been reflecting on why more statutory youthworkers aren’t blogging on my blog through exploring my own concerns, reservations and queries. As a real newbie to this it’s an exciting but time consuming adventure which I’m keen to explore. I think for me two of the main reasons I can see colleagues giving would be time and knowledge. Oh – and possibly the online safety concerns. I’ve had a look at the one pager on Mikes’ site and will try that out whilst I go in search of more answers. It seems like blogging would be a fantastic reflective practice tool, particularly for trainee youthworkers and I wonder whether it is something to explore with the course providers. I will take this up in our own LA and the universities we work with. What an interesting time it is to expand personal skills and knowledge with the use of blogging. I do believe that being able to connect with others in the field is crucial and can be an effective means of strengthening our skill base and at the same time building personal resources that can help us be more effective in the child and youth service we provide. Although I am no longer a student in school preparing myself to work with the social emotional arena of children and youth development, I personally have found that learning mode continues as we learn from the experience of self and others. Learn and change, change and learn! I do believe that blogging is an effective two-way learning tool. One, as a chance to share field related learning experiences with others and two, in the sharing process making make full use of the experience as a much needed self-reflective exercise. I also think blogging could be a very useful means to explore useful service related resource possibilities that can enhance the service we provide. I am Youth-Worker who blogs!!!!! This was a great blog post, and I will be linking it from my blog. Tim in this article you stated ‘And I’ve not yet managed to find a single one of the 27,000 statutory sector youth workers out there…..’ – i have struggled to find accurate numbers of professional youth workers in england – could you tell me where this figure came from? and whether there is any breakdown of those figures? or can anyone else answer that? I believe the NYA have changed the way the audit is carried out (and it has been complicated by changes in workforce structure which mean that the definition of a statutory sector youth worker is tricky to draw….) so there may well not be any comparable up-to-date figures.